In the modern utility and industrial world, ASSET MANAGEMENT is an expression that covers a multitude of tasks from finding out where all the current buried services are (in three dimensions), through plotting this information on a recognised, accepted and assessible (often electronic) system, to knowing what state the asset is in and therefore gaining sufficient knowledge to know what, if anything, to do with the asset in terms of maintenance, repair or replacement. As mush of the use of the information depends on individual company policy, financing availability etc, the following will concentrate, in the broadest sense, on the range and types of equipment, technology and services that are currently available to aid engineers in their information gathering and recording efforts. As with all buried service operations, even open cut, knowing what you are going to encounter in the ground is as important as knowing what you are ultimately going to be putting into it. As with most construction techniques preparation is as much a part of the success of a project as is the final installation, because in many cases one cannot be achieved without the other. It is quite simple, you cannot mend or replace what you cannot find and you cannot install something in a place where something already exists. One of the most common complaints across the globe is that utility plans, for almost any service you can name, are simply not up to date or accurate. Without an accurate map of existing services a contrcator or utility installation or repair team always run the risk of damage to or loss of existing services or even worse injury to personnel. The starting point for any site survey has to be the existing plans. These should show expected manhole/access and services locations that can be used as starting points for a more detailed confirmation of service corridors prior to the start of the main works. Trial Holing – This is one of the most common methods of buried service confirmation. The method comprises the digging of a small inspection hole over the top of what is believed to be an existing service. If the trial hole intersects the expected service(s) the information is correct, if not it is wrong. A series of such holes is used to ‘spot check’ points along the route indicated on the existing plan. If the majority of these holes intersect the service(s) expected then all is well, if not then another avenue has to found to confirm the precise position of the services. The disadvantage of the technique is that it is only a ‘spot check’ technique – if intersections are found at the trial holes it is assumed that the intervening plotted route remains correct also – this may not always be the case! It also requires the insepction team to inflict damage to existing road/pathway surfaces which may cause disrptuion to businesses and traffic as well as the general public and has to be reinstated to the correct standard once its use is completed. For many years trial holing was the only way to confirm existing information on buried services, with the hole being dug by pick and shovel or backhoe excavator. More recently however, the introduction of vacuum excavation equipment has made this task quicker easier and more accurate in that it can produce very specifically sized and positioned holes. 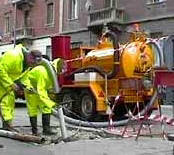 Vacuum excavation uses a combination of either compressed air or water in a jet to cut and loosen the ground at the trial hole site. The spoil produced is then vacuumed away from the hole by a suction system (often on the same machine as the cutting tool or lance) with the spoil being removed for disposal or treatment for later reuse as backfill. The advantage of these new systems is that they can excavate very quickly, make precisely sized holes and can intersect existing services without the fear of damage to them, unlike the older backhoe or shovel techniques, therefore limiting service downtime, expensive repairs to third party plant and minimising personnel injuries. Tracing and Mapping – This area comprises a variety of techniques and systems that enable buried plant to be surveyed without excavation. The systems, in the main, comprise the use of electromagnetic equipment that locates a buried service remotely from surface. The main Electromagnetic or EM systems utilise walk-over methods that trace either the natural signal generated by a power-carrying cable laying in the Earth’s magnetic field or for non power networks e.g. metal pipes, the use of a signal generator to push a traceable signal into the pipe material from an access point such as a manhole. A multi-frequency antenna system is used to locate the signal at the surface with the peak value indictaing a position directly over the buried service. Many services also offer the ability to use this signal to estimate the depth of the service. Where non-metallic pipes or networks need to be traced and mapped, two systems are available to achieve this. The first utilises the walkover antenna as in the description above. In this case however an active radio beacon or sonde is pushed through the pipe from a known access point on the end of a rod. The signal is located and plotted as the rods advance through the pipe at measured intervals enabling the position to be mapped accurately. The second is Ground Probing Radar (GPR). Ground Probing Radar (GPR) is becoming a useful locating tool in the bureied service engineer’s arsenal. 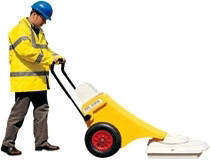 GPR is a technique that may be utilised if EM techniques cannot be operated. GPR uses a signal generating antenna to pulse specific frequency radio waves into the ground. This signal reflects off objects in the ground and the reflection is picked up by an antenna. Highly sophisticated computer software interprets these reflected results to indicate the position depth and often estimated size of the buried object. Many systems now offer quite expansive information directly from the onboard computer although some systems do require office-based interpretation by specialist engineers. The latter of course is more time consuming but does offer a ‘human’ cross check to computer generated information. Multi-channel GPR units claim to offer more precise and accurate information as compared to single channel systems, the choice is for the end user depending on the accuracy of the final information required. Both EM and GPR systems offer the abilty to locate services in 3-dimensions and more often than not both techniques are used in conjunction with each other to give the most accurate survey possible in the prevailing ground conditions. Depending on the circumstances of any particular project, there is normally a need to undertake a pre-project inspection of the utility or pipeline to either help establish the state of repair or to aid the selection process for the technique to be used for any subsequent works and to ensure that technique will not be adversely affected by prevailing conditions. In man-entry sized pipelines this can be done by simple walk-through or crawl through inspection. In non-man-entry sizes this needs to be done remotely using, in the main CCTV cameras, sonar, radar/EM or laser light systems. Sonar systems give the abilty to ‘see’ below existing flows and through silt to give an image of the pipe invert that cannot be seen using CCTV. Similarly some systems offer EM or radar based systems to inspect pipe wall thicknesses and corrsion levels – these are often mounted on elecronic pigs and operate over long distances in cross country pipelines such as gas or oil. Laser light surveys give an image of the state of repair in terms of shape of the inside of a pipe, information which can be vital when assessing the need for and type of lining system to be used for instance, as it highlights the least diameter of the pipe. CCTV – As well as being an Asset Management tool, CCTV is also used as a contracting tool where pre- and post- works inspections are carried out to ensure a pipeline is fit for work and that, after installation, the works have been completed to the required standard. CCTV camera systems come in a variety of formats including integral camera/lighthead units that are progressed through a pipe on the end of a push rod that connects directly to a viewing screen, to highliy sophisticated ‘scanning’ heads that give 360 ° internal pipe coverage. 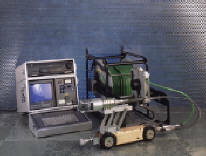 The push rod systems tend to be used by smaller operators on smaller diameter pipelines for on-site fault finding, whilst the more sophisticated systems offer the ability, in association with specialist software, to record both as picture and as on screen comment location, length and faults found in a recognised formats that are becoming common across many utility operators. The simpler forms of this type of CCTV system come as a camera mounted on either a skid or tractor system with the associated light heads to illuminate the pipeline. Skid-mounted systems require a winch wire to drag them through a pipe whilst tractor -mounted units are self-propelled. A variation on the basic systems are those that are ‘explosion-proof’. These have been specially designed to operate in pipes where expolsive atmospheres may be encountered, for example methane. These system tend to be tractor-mounted due to the reduced risk of sparking that might be associated with a skid mount. The most recent development in the CCTV field has been that of the 360 ° view CCTV camera. This system is tractor-mounted and passes through the pipe in the same way as a standard CCTV system. However the system has a ‘fish-eye’ lens that can view the full circumference of the pipe as it passes. Software can then be used to view the full circumference as a flat picture. Some software has the ability to recognise potential defects and highlight them on-screen. As well as the main line systems there is also a variety of CCTV systems that can survey inside a lateral connection using a mainline tractor to locate it within the pipe. These system often involve extendable camera heads that emerge from the tractor body to enter directly into the lateral opening. This range of equipment offers the operator a wide choice which ultimately depends on the range of operations that will be required of it and the amount of details required in the final output both in terms of picture and of on screen information available to the observer. Information gathered using any or all of these systems can then be input onto GPS systems or onto existing plans with size, depth, position, material and state of repair and any other relevant information so that it can be easily accessed by engineers at any time. Increasingly the output of CCTV surveys is being stored electronically to simplify and speed up access when required. Whilst CCTV is regularly used as Condition Assessment tool, on some long distance pipleines electonic Pigs are also available for this sort of work. These pigs are more often used on metalic pipe where corrosion assessment is a vital part of the ongoing asset management work. They work on electromagnetic analysis of the pipe wall, normally storing information in a onboard computer for later analysis by an office based team. The Oil and Gas industry use these sorts of pigs on a regular basis in major transmission pipe lines. Another important part of Asset Management may at first not be obvious, however once the location, condition and operational needs of a network are known this will normally mean that, at some time, work will need to be carried out on it. Once a decision has been made as to what sort of work and its time frame, the need to assess whether a by-pass service is required arises, which makes this an Management of Asset topic. Whether the work is being carried out on a gravity or pressure system, it is there to perform a purpose and to provide a service to customers, so to simply remove the service whilst work is done may not be an option. A full assessment of the work and its time scale will indicate if a by-pass service or alternate supply is required to maintain the service to the customer. It is also important that if such a service is needed the customer be kept fully informed of the situation. If the service is to be off-line without an alternate being installed it is also important that customers are aware of just how long the situation will remain in force and how, if required, they should minimise service use over the works duration.